February 5, 2018 — Links International Journal of Socialist Renewal — A brand new World Bank report, The Changing Wealth of Nations 2018, offers evidence of how much poorer Africa is becoming thanks to rampant minerals, oil and gas extraction. Yet Bank policies and practices remain oriented to enforcing foreign loan repayments and transnational corporate (TNC) profit repatriation, thus maintaining the looting. ANC deputy president Cyril Ramaphosa's Lonmin's Bermuda-based "marketing" operations were revealed as a major source of tax avoidance. Click for more by Patrick Bond. For more on South Africa, click HERE. November 20, 2014 -- Links International Journal of Socialist Renewal -- “South Africa is achieving a sizable reduction in poverty and inequality through its fiscal tools" -- that was the main claim by the World Bank’s Pretoria-based country director Asad Alam last week, in the foreword to the November 2014 report, Fiscal Policy and Redistribution in an Unequal Society. The World Bank has made the world a worse place: socially, politically, economically and environmentally. October 11, 2014 -- Links International Journal of Socialist Renewal -- In Washington DC and 10 countries across the globe, protests on October 10 targetted the World Bank during its annual meeting. Many are asking, isn’t 70 a dignified age for institutional retirement, especially for policies and practices long considered destructive but now seemingly back in official favour? Founded in 1944 to finance war-torn Europe’s reconstruction, the World Bank is now suffering one of its most severe credibility crises, accentuated by a new civil society campaign, "WorldVsBank". South Africa’s three largest cities host teach-ins because this country, after all, was the model "Knowledge Bank" pilot after 1990. 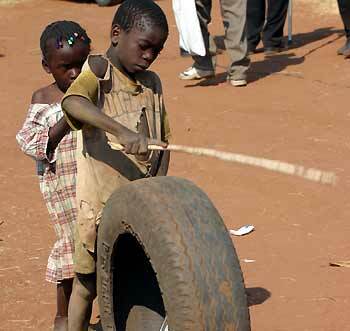 Africa’s ‘rising’ or overdue uprising? the rapid spread of mobile phones, from a few million in 2000 to more than 750 million today. Business increasingly dominates foreign interest in Africa. Investment first outpaced aid in 2006 and now doubles it. BRICS bloc’s rising ‘sub-imperialism’: the latest threat to people and planet? President Dilma Rousseff of Brazil, Russian President Dimitry Medvedev, Indian Prime Minister Manmohan Singh, Chinese President Hu Jintao and President Jacob Zuma of South Africa pose prior to the BRICS summit in New Delhi on March 29, 2012. November 22, 2012 – Links International Journal of Socialist Renewal -- The heads of state of the Brazil-Russia-India-China-South Africa (BRICS) network of governments are coming to Durban, South Africa, in four months, meeting on March 26-27 at the International Convention Centre (ICC), Africa’s largest venue. Given their recent performance, it is reasonable to expect another “1%” summit, wreaking socioeconomic and ecological havoc. And that means it is time for the first BRICS countersummit, to critique top-down “sub-imperialist” bloc formation, and to offer bottom-up alternatives. After all, we have had some bad experiences at the Durban ICC. A nascent oil palm plantation in southeastern Sierra Leone owed by Socfin Agriculture Company, which in March 2011 signed a 50-year lease with the government of Serra Leone. Photo by Felicity Thompson/IRIN. November 6, 2012 – Links International Journal of Socialist Renewal -- Since the global financial crisis of 2008 and its associated food crisis that sent another 200 million people into malnutrition, there has been a massive grab for land by large corporations around the world. Worst hit has been Africa, where food security is already non-existent for many people. Governments, including the Australian government, welcome this “investment” in agriculture, some bizarrely claiming that food security will be increased. 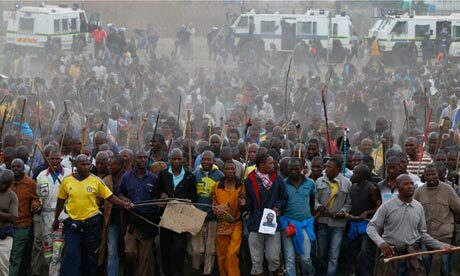 More than 3000 mineworkers take part in a march at Lonmin's Marikana mine in South Africa on September 5, 2012. Photograph by Mike Hutchings/REUTERS. For more on the Marikana mine massacre, click HERE. September 5, 2012 -- Links International Journal of Socialist Renewal -- “One of the things you learn as an anthropologist, you don’t come in and change the culture”, Dartmouth College president Jim Yong Kim told wealthy alumni when contemplating the institution’s notorious hazing practices, prior to US President Barack Obama’s request last February that he move to the World Bank. Kim’s Harvard doctorate and medical degree, his founding of the heroic NGO Partners in Health and his directorship of the World Health Organization’s AIDS division make him the best-educated, most humane World Bank president yet. A decade ago, he co-edited the book, Dying for Growth, pointing out that "Washington Consensus" policies and projects had a sharply adverse impact on health. The bitter reality for Afghan women: an address by Malalai Joya. May 20, 2012 -- Stop the War Coalition, Sydney -- Amnesty International has muddied the waters over the occupation of Afghanistan with its latest campaign urging NATO to “keep the progress going” on women’s rights. The campaign was aimed at a NATO summit in Chicago and drew on one of the few remaining arguments for continued military occupation of that war-ravaged country. The idea that a military occupation would somehow help Afghan women was promoted by Laura Bush, wife of the former US president who ordered the October 2001 invasion. It is an argument that been rejected by the Afghan women’s group, Revolutionary Association of the Women of Afghanistan (RAWA) and by activist and former Afghan MP Malalai Joya (see video above). They say that the NATO occupation has simply added a third enemy, on top of the Taliban and the NATO-backed warlords. Jim Yong Kim is also known for his rapping and dancing with talented Dartmouth College kids. April 5, 2012 -- Links International Journal of Socialist Renewal -- That 66th birthday month of his, March 2012, was auspicious for adding a little spice to his dreary life, but no, it just can’t last. Born in March 1946 alongside his evil twin, IMF, in Savannah Georgia, after conception in what must have been a rather sleazy New Hampshire hotel (the Bretton Woods) in mid-1944, the old geezer known as the International Bank for Reconstruction and Development, or much better by his nickname World Bank (but let me just use WB), really ought to be considering retirement. Not to be ageist (ok just this once), but still, it’s patently obvious that WB’s relentless WashCon ideology is so last-century, so discredited by recent world financial melting, and so durably dangerous in today’s world. His presidents have reflected the worst of the old yankee imperialist mindset. And let’s not even start on IMF’s extremist lads and lass, who in recent years have migrated their austerity dogma from North Africa to Southern Europe and to my native Ireland, meeting growing resistance along the way. Listen to "Feeding Ten Billion"
January 11, 2012 -- In a Saskatoon lecture, writer and activist Raj Patel argues that the only way to feed everyone is to completely rethink agriculture and empower women. He outlines the history of the "Green Revolution" and how it was based on attempts to defeat "communism", control population and spread the market system. The lecture was broadcast on the Canadian Broadcasting Corporation's Ideas program. June 1, 2011-- Rosa Luxemburg Foundation Palestine office, posted at Links International Journal of Socialist Renewal with permission -- In their latest documents and meetings, the G8, the World Bank and the International Monetary Fund (IMF) reacted to the democratic movements in the Arab world: The recipe calls – as it did before the popular ousting of the Tunisian and Egyptian presidents – for privatisation, austerity measures and “market liberation”. Patrick Bond, economic advisor to the new South African government from 1994-2002, analyses the ramifications of the economic campaign on Tunisia, Egypt, Libya and Palestine. May 29, 2011 -- Jadaliyya, posted at Links international Journal of Socialist Renewal with the author's permission -- Although press coverage of events in Egypt may have dropped off the front pages, discussion of the post-Mubarak period continues to dominate the financial news. Over the past few weeks, the economic direction of the interim Egyptian government has been the object of intense debate in the World Bank, International Monetary Fund (IMF) and European Bank for Reconstruction and Development (EBRD). US President Obama’s 19 May speech on the Middle East and North Africa devoted much space to the question of Egypt’s economic future – indeed, the sole concrete policy advanced in his talk concerned US economic relationships with Egypt. 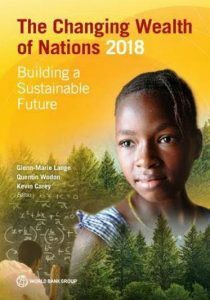 May 30, 2011 -- Links International Journal of Socialist Renewal -- A renewed wave of development babble began flowing soon after the February launch of the World Bank’s 10-year strategy document, Africa's Future and the World Bank‘s Support to it. Within three months, a mini-tsunami of Afro-optimism swept in: the International Monetary Fund’s Regional Economic Outlook for SubSaharan Africa, the Economic Commission on Africa’s upbeat study, the African World Economic Forum’s Competitiveness Report and the African Development Bank’s discovery of a vast new “middle class” (creatively defined to include the 20% of Africans whose expenditures are US$2-4 a day). Africans who spend between US$2-$20 a day are now "middle class", says the African Development Bank chief economist Mthuli Ncube. African agriculture and the World Bank: Development or impoverishment? December, 2007 -- Agriculture's dominant role in Sub-Saharan Africa's local, national and regional economies and cultures throughout pre-colonial history has been foundational to 20th century colonial and post-colonial development. No other continent has been so closely identified with smallholder peasant farming. Nonetheless, smallholder farming has been eroding over the last three decades, perpetuating rural poverty and marginalising remote rural areas. Donors' search for rural ``success stories'' merely reinforces this fact. Certainly many farmers have voted with their feet by increasingly engaging in non-agricultural livelihoods or migrating to urban areas. In so doing, the significance of agriculture for the majority of Africa's population has altered.